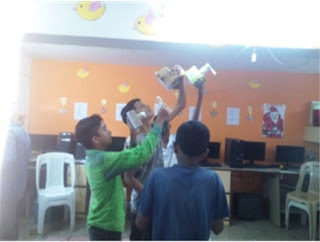 At one of the regular English classes that I conduct at the Kondhwa DSS site, one of the children made a working model of a crane using scrap material. The complex principles of Hydraulics and Pneumatics were very simply explained by this 12 year old boy. It was an eye opener for me and it made me realize that even without any practical exposure, the kids at Door Step School have a lot of talent and a knack for hands on application of science. During the annual event of Door Step School, we got an opportunity to see the kids performing some simple experiments and explaining Air Pressure. They were very excited and enthusiastic in explaining these experiments to the visitors. 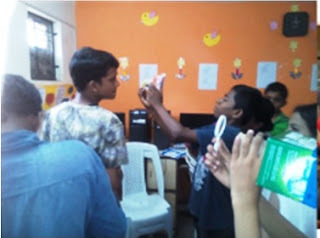 With our inclination to teach Science especially through hands on experiments and activities, we decided on conducting a science day for the kids at Door step school. The key objective of this event was to create an interest in the children about science and to demonstrate a few key concepts with hands on experiments that would aid in learning. We put forth this idea to the DSS representatives. We got in touch with Sunila Madam who is doing an awesome job of running the Community Center in Dattawadi. She immediately acted on our proposal and set up a meeting with some of the children in that community to gauge their interest. We were pleasantly surprised to see how well the Dattawadi Center is equipped. They have a clean and big class room, computers, books, stationary items and a well-equipped Science Lab. We got a good understanding of the educational background of the children who would be participating in the program especially the language they understand and whether or not the principles we were to cover would be easy to grasp. We agreed on the date of the event, no. of students, curriculum and also got some enthusiastic children volunteering for the event to help the younger ones. The event was planned for the 13th of June between 11 am to 4 pm. We started with the preparation for this action packed event and got the material to assemble the kits to be given to the kids. The unique part about this camp was that every child would perform the experiments using his or her own kit. It proved to be very exciting for the children as once done, they were allowed to take their projects home. 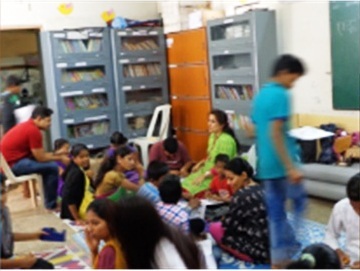 On the day of the event, we were a team of 6 enthusiastic volunteers (Veenu, Manoj and Sharmishtha from Wipro, Arun from Cognizant and Jessica and Yogita from Tech Mahindra) along with the DSS teachers and Sunila Madam, who is in charge of the Centre. We reached the venue at 10:30 am with some apprehensions. We wondered if there would be enough participation and if the kids would adhere to the time? We were not let down this time as well. The DSS kids were on time and we got an overwhelming response of 24 children across 3 sites. These children were studying in Class 5 and above. In the initial introduction round, we got to hear from the children on what all they knew about science. Some of them came up with real interesting topics like Air Pressure, Gravitational force, Digestive system, Acids and Bases, a great mix of all the branches of science. We started off with the first project which was to make a ‘Winning Connector’. This involved creation of an electric circuit in which the light bulb glows if the correct match is found. It required a lot of patience and an attention to detail like connecting the right nodes, fixing the wires neatly and getting the light bulb to glow. The kids were quite creative in naming the pairs as part of the game. Some chose to depict national animals and birds with their names, Marathi to English translations while others chose to match names with pictures and various sports with equipment. The kids thoroughly enjoyed the experience and were all excited to start with the next project. We broke for lunch and again wondered if the children would come back as most of them had stepped out to their homes for lunch. At 1:30 pm, as per the plan, we had the entire class bustling with kids, all charged up for the next experiment. The making of the Camera was probably their best experiment. Th kids were very amused by the simple concept behind the camera and were awe struck when they could capture real images on the screen. Here, I would like to mention an unforgettable moment, when a 7thstd child, Prem, came up to the board to explain why the image on the screen of the camera was inverted. The whole class clapped for him. Post this we covered the properties of Air, how air does work for us as well the concept of Air Pressure and how our Lungs function. 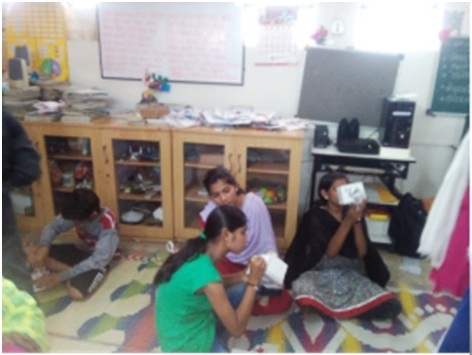 Even though we explained the topic in multiple languages (Hindi, Marathi and English), the kids were able to understand us well. This clearly reflects their grasping of the language. They had some fun with balloons during this experiment. The last experiment was the making of a Periscope. Although, the kids were quite exhausted by now, not a single child was lagging behind. This experiment involved the creation of a box and making a 45 degree slot for the mirror and fixing it so as to see it work. The kids were quite careful with the mirrors. I want to emphasize that in the entire camp there were no episodes of any mishandling and breaking of the equipment. 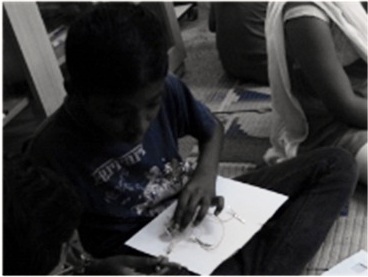 The kids were very careful with their own kits and the things they made which were like their prized possessions. Finally we ended the action packed day with a powerful speech given by Sunila Madam. She is a great coordinator and is very connected with the children. She knows exactly how to maintain the discipline in the class and how to handle so many children coming from such diverse backgrounds. Her patience, courage and commitment is highly commendable. Before wrapping up for the day, the kids agreed to share write ups on the things they made at the camp. The camp came to a close with the distribution of sweets. It was great to see the involvement of the children, their inquisitiveness, their commitment and zeal to get things to work and their timeliness. We are thankful to the Door Step School for giving us this opportunity to conduct the Science camp at Dattawadi. It has been one of the best science camps that we have conducted and the entire experience has been very enriching and rewarding. On a parting note, I noticed that the DSS kids were visiting Wipro today. This is a great opportunity and a good platform for volunteers from organizations to identify kids that have a knack for science so that they can go forward and mentor these kids on a one to one basis. Day camps or even the formation of focused groups who can assist these kids in understanding scientific concepts can help in bringing these kids up to speed and enable them to have a successful future. I am sure the memories of this day will always be very special to every DSS child who participated motivating each to do better and bigger things. A big thank you to all the volunteers...bet you are already planning the next event!